On Apple's iOS devices, including the iPhone and iPad, the Safari browser performs internet searches using Google by default. You can change the search engine default at any time by modifying Safari settings on your mobile device. The search engine options available on iOS 10 and iOS 11 are Google, Yahoo, Bing, and DuckDuckGo. Making a change to one of these search engines requires just a few taps. 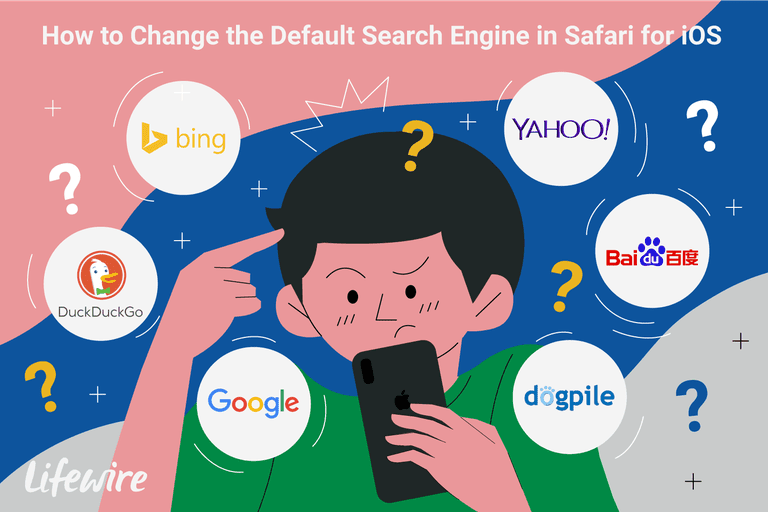 When you change the default search engine on Safari for the iPhone or iPad, all future searches are performed through that particular search engine, until you change the default again. You aren't prevented from using other search engines, though. You can, for example, type Bing.com in Safari to go to the Bing search screen, or you can download the Bing app and use it to search Bing. Google, Yahoo Search, and DuckDuckGo all have apps you can download to your iOS device for those time you don't want to use the default in Safari for searches. Open the Settings app on the Home screen of your iOS device. The current default search engine is listed next to the Search Engine entry. Tap Search Engine. Choose a different search engine from four options: Google, Yahoo, Bing, and DuckDuckGo. Tap Safari in the top left corner of the Search Engine screen to return to Safari's settings. The name of the search engine you chose appears next to the Search Engine entry. Search Engine Suggestions: Presents suggested search terms as you type, obtained from the default engine. Safari Suggestions: Offers suggestions as you type, derived from a combination of sources including iTunes, the App Store, and the internet as a whole. This option also sends some of your search data to Apple, including which suggestions you selected. Quick Website Search: When you search within a particular website, Safari stores that data for future use, allowing you to then search that site directly from the Smart Search Field in subsequent browser sessions. Preload Top Hit: Safari attempts to determine the best search result as you type, preloading that page ahead of time so that it renders in an instant if you select it. The determination process uses a combination of your browsing history and saved bookmarks. Enter or choose autofill information to fill in forms on websites. Activate frequently visited sites in Safari. Allow websites to check if Apple Pay is set up on your device.